Description: The American Freedom Train arrived for display on former PRR trackage which has long since been removed. Description: Here is page 42 of a 96-page monograph entitled "Power To Burn: Smoke, Steam, & Cinders" that was edited by James M. Shafer and published during 1976. 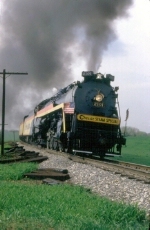 Partial Caption: "The steam locomotive of the American Freedom Train, a former Reading Railroad T-1, No. 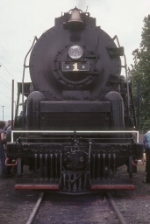 2101, is shown as it was being serviced at Altoona on July 6, 1976." Reading Railroad engine #2101 is a T-1 (4-8-4) "Mountain" built by the Baldwin Locomotive Works during 1945, and temporarily renumbered "1" for the American Freedom Train. Photo taken at the Altoona Passenger Station; a portion of the 12th Street Footbridge is visible at the far right. Description: The American Freedom Train was on display in Trenton, NJ, for all to see on 8/31/76. Picture taken by Skip Borsos. Used with permission. Description: The American Freedom Train in Trenton, NJ. Taken by Skip Borsos & used with permission. Description: Celebrating America's Bicentenial, with 4-8-4 2101 being in charge of the AFT on the East Coast. Taken by Skip Borsos & used with permission. Description: A schematic of Reading 2101 (AFT 1). Taken by Skip Borsos, and used with permission. 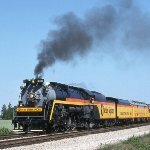 Description: I went to see the AMT(PRR) GG-1 4935 inagural run north, and was surprised by this! 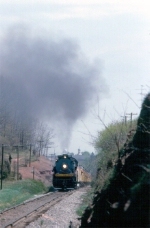 Description: Ross Rowland's RDG T-1 4-8-4 #2101 at steam as the "Chessie Steam Special" in Philadelphia in May, 1977. Description: Ross Rowlands RDG T-1 4-8-4 #2101 "Chessie Steam Special" with duel tenders at Philadelphia in May, 1977. Description: Ross Rowland's Chessie Steam Special was ready to roll in Philadelphia in May, 1977. 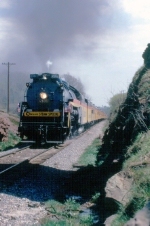 The former I-10sa Consolidation converted by Baldwin into a Reading class T-1 Northern in 1945 was rescued by Rowland after retirement in 1964 from service as part of the five T-1's used for the Reading Rambles. Description: Ross Rowlands RDG T-1 4-8-4 #2101 at steam as the "Chessie Steam Special" in Philadelphia in May, 1977. Description: Showing what she did best, Ross Rowlands RDG T-1 4-8-4 #2101 takes a run by at Philadelphia in May, 1977. Description: Ross Rowlands RDG T-1 4-8-4 #2101 takes a run by in Philadelphia on May 14, 1977. 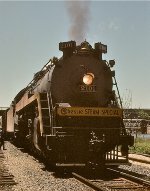 Description: Ross Rowland's Chessie Steam Special was ready to roll in Philadelphia in May, 1977. With many railfans stepping in front of the big steamer for their picture, it was hard to get a clear shot of the whole unit. 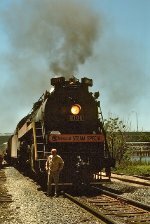 Description: An older railfan steps up to RDG #2101 for a picture as the Chessie Steam Special gets ready to roll in Philadelphia on May 14, 1977. Description: Having just arrived at the Cleveland W. 3rd St. B&O yard on a ferry move from Pittsburgh, the inbound crew from the Chessie Steam Special poses in front of ex-Reading T-1 2101. L-R, Chief Mechanic Steve Wickersham, fireman Tim Sposato (now CMO for Jerry Jacobson), and Cleveland Chessie System engineer Joe Seaman. Date approximate, please correct if you know for sure. Description: Chessy Steam #2101 at Fulton Yd. Description: Chessie Systems 2101 approaches a cut in Gettysburg PA while on a fan trip. Description: Chessie Steam Special 2101 at an unknown locaiton.